I am about to finish a big refactoring and want to clean up my changes before commit. However IDEA never receives those keystrokes. Change or disable them. As for me, I never used those operations so I disabled them. For all regular combinations it shows proper Keypress events. @Sperez have you tried https://askubuntu.com/a/980116, https://unix.stackexchange.com/a/394150? 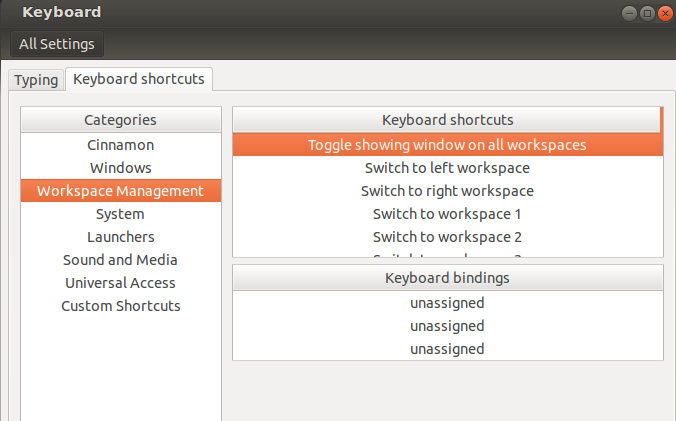 In Ubuntu Unity 8 (based on Gnome Shell, Ubuntu 18.04 or newer), by default the `Shift+Meta+Page Up` is used for "move window one workspace up", but I think there is also an invisible binding for `Ctrl+Alt+Shift+Up` as well. You can get rid of this invisible binding, by opening the Settings / Devices / Keyboard and manually setting the "Move window one workspace up" to Shift+Meta+Page Up. The setting key combination will show in bold, and now the `Ctrl+Alt+Shift+Up` should no longer be captured by Unity.